One of the exceptional benefits of an elderly care provider in your parent’s life is their ability to help your aging loved one maintain better nutrition. What your parent eats is essential to their health and wellbeing, but sometimes it can be a challenge to plan and execute healthy, delicious meals and snacks. Their elderly health care services provider can help your parent handle tasks such as menu planning, grocery shopping, and meal preparation so that your loved one can enjoy better nutrition more easily. June is Dairy Month. This is the perfect time for your parent to explore the health benefits of dairy and find delicious ways to integrate these healthy products into their regular nutritional approach with their elderly care provider. • Protein for energy, muscle building, and wound healing. Just one serving of milk, for instance, contains 8 grams of protein. • Calcium to support strong bones. 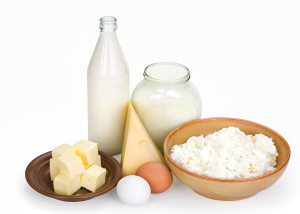 Dairy products are the leading source of calcium in the average American diet, and many are supplemented with vitamin D to aid in absorption and use by the body. • Potassium to help support healthy blood pressure. This can protect your parent from cardiovascular disease and stroke. There are many ways that your elderly parent can enjoy dairy products, including a glass of milk, a serving of cheese, or a cup of yogurt. Ice cream, however, is a particular favorite. Serving up a big bowl of ice cream may not seem like a great way to keep your parent’s nutrition in check, but this machine-free option is not only delectable, but healthy. It is also a perfect activity for your parent to do with their elderly health care services provider. This recipe features the favorite flavor combination of chocolate and peanut butter for a smoothie that tastes as rich and indulgent as dessert, but packs true nutrition for a healthy option. • Place the condensed milk, peanut butter, salt and vanilla in the large metal bowl. • Beat the ingredients together with the electric mixer. • Turn the mixer to low and beat in the milk, cocoa powder and yogurt, until well combined and smooth. • Scrape down the sides of the bowl as it becomes necessary. • Cover and place in an ice bath. • While the ice cream mix sits in the ice bath, freeze a freezer safe pan or shallow bowl. • Place the ice cream mixture into the cold pan. • Chill for 20 minutes in the freezer. • Check to see if the edges have begun to freeze, and stir rapidly with the whisk or spatula, breaking up any partially frozen ice cream. • Continue to stir the ice cream every 30 minutes vigorously, until it cannot be stirred any longer and has become a smooth creamy ice cream. • If the ice cream becomes too hard, remove and place in the refrigerator until it becomes soft enough to beat. • Store in a covered freezer container until you are ready to serve. For in-home Elderly Care in Covington TN, please contact the caring staff at Personal Care Services MidSouth today! This entry was posted in Elderly Care Covington TN and tagged Elderly Care Covington TN. Bookmark the permalink.